The Family Policy Program at Oregon State University provides transparency in quality of care for children for the State of Oregon. Quality of childcare provision is crucial to a child’s education and well being, since many working mothers and fathers rely on after school programs or private child care facilities. 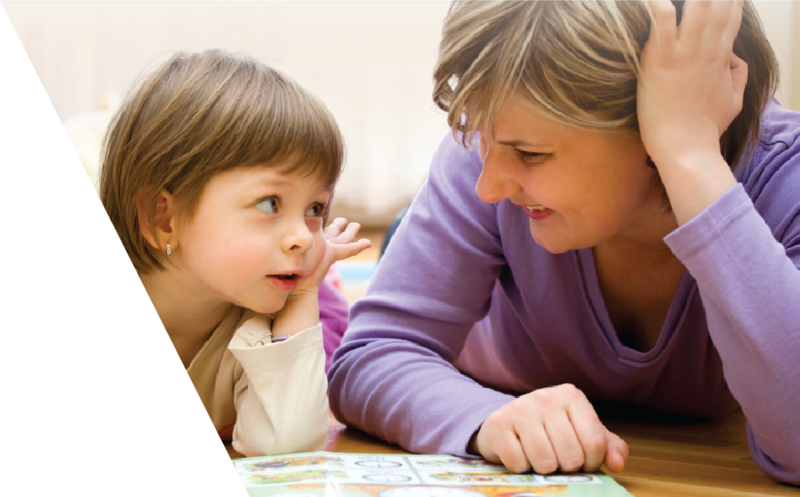 The goal is to support parents by providing qualitative information on licensed child care facilities in their community. Each facility is individually visited and assessed across benchmark criteria and given a score. A website captures this quality score and provides publicly accessible information with data based on the quality indicators. The website is a critical component of the quality indicators program (QIP) and is perceived as the most credible source of data produced by the Program. Therefore, successful navigation of the website by users, including interpretation of the design layout and content was important. Specifically, the Family Policy Program was interested in measuring the ease of use of the current QIP website including how well parents and care providers were able to understand the existing website. The goal of the user testing was to identify modifications to website satisfaction and ease of use. The critical piece was that improvements identified had to work with technical and budget constraints. It wasn’t enough to just find issues, solutions had to fit the reality of the constraints. 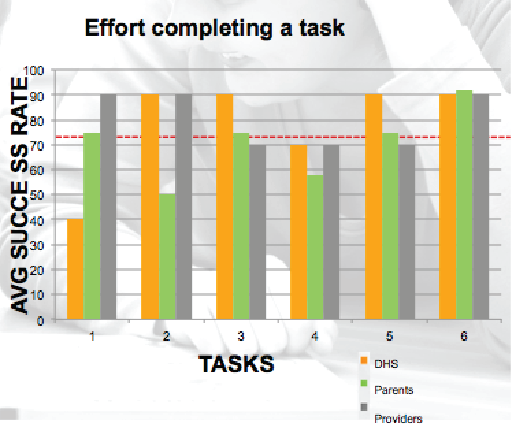 Experience Dynamics would go directly to parents seeking childcare in Oregon and evaluate the usability of the QIS website in order to determine how successful they were with existing navigation, layout and terminology. The insights would help pinpoint and prioritize weak or underperforming areas of the site. Testing would be conducted in two waves: current site, then a redesign of key areas followed by post-change testing (to measure longitudinal effectiveness). Experience Dynamics recruited 15 users seeking childcare. A range of DHS, mixed income and child care providers were included. Users would use the site how they normally did, in order to gain a typical view. We observed them in our usability lab (www.usabilitylabrental.com). In addition an online survey would be used to help assess terminology: eg Did parents understand quality indicator terms and concepts? The usability testing gave OSU/ State of Oregon an empirical measurement of key usability metrics (errors, confusions and success rate) based on actual user performance. It revealed structural weaknesses in search: “Why is this taking so long”…but more importantly in interpreting the quality score results. “What does this score mean? Can I trust this facility to provide care for my child?”. 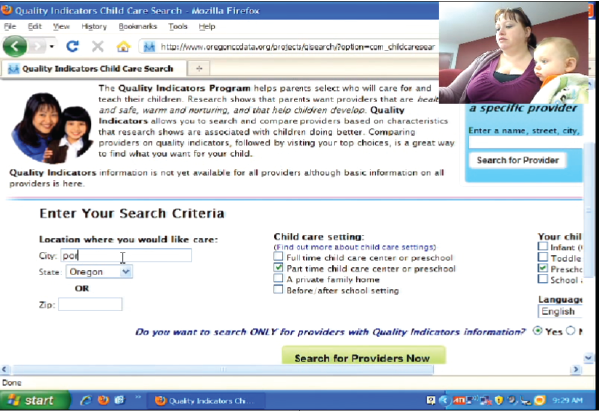 Usability Testing showed that parents were less successful comparing facilities and understanding, for example, how the site ranked education as a quality indicator in childcare (task 4, image left). Test data and insights were used to create new designs, addressing user confusion and errors. The new concepts were subjected to usability testing to ensure they were easy to use and easy to understand. Ease of use increased 82%, while ease of comparison and understanding quality indicators rose by 115%, compared to the original design.